WildWoodRoseVintage ✧ 301-290 McDermot Ave Check Instagram @wildwoodrosevintage for shop hours. 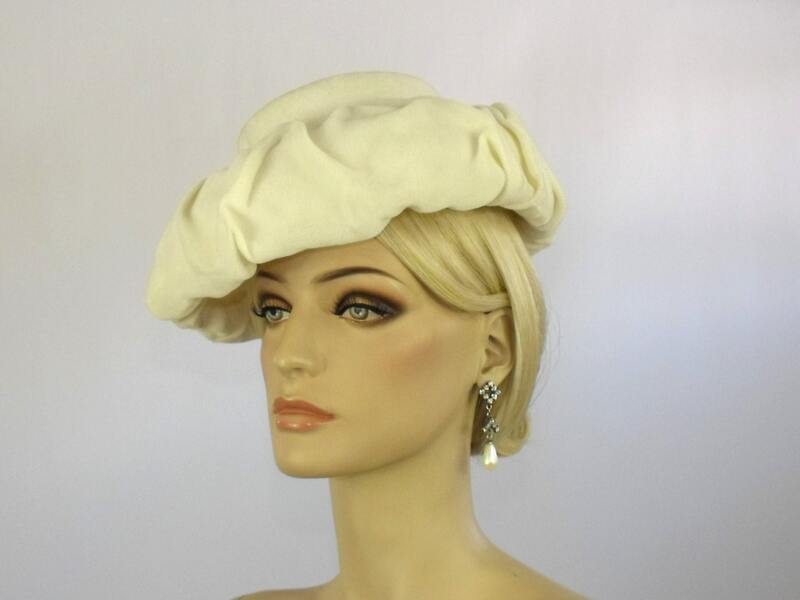 Lovely ivory velvet cocktail hat circa 1940's is in very good vintage condition. 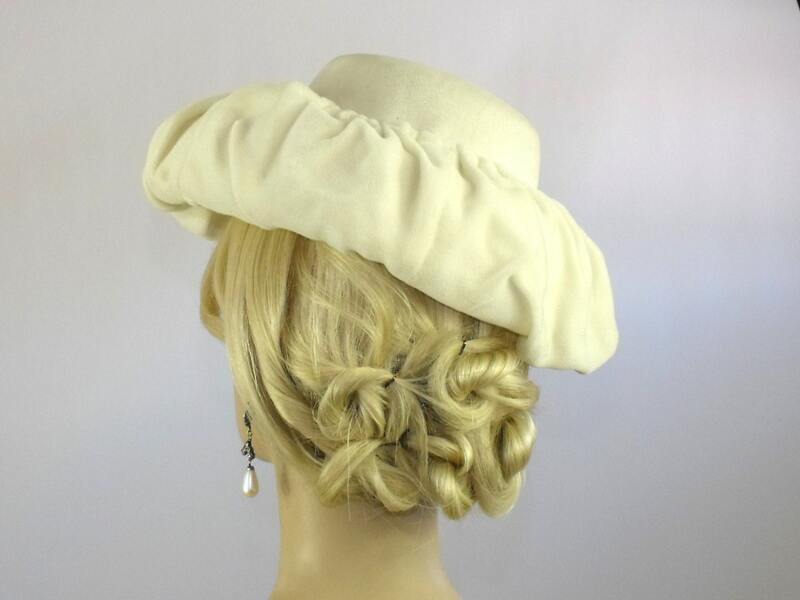 Perfect for a vintage wedding! 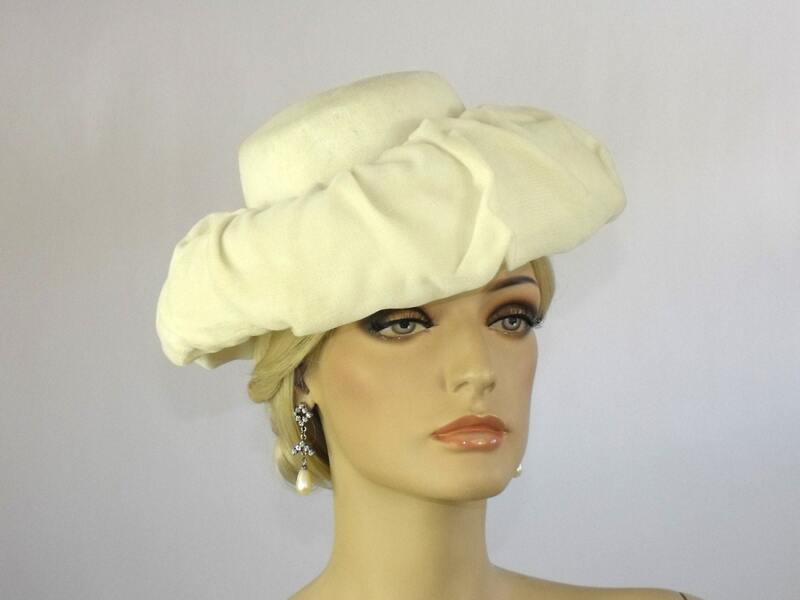 This hat is a fine example of excellent quality and craftsmanship! 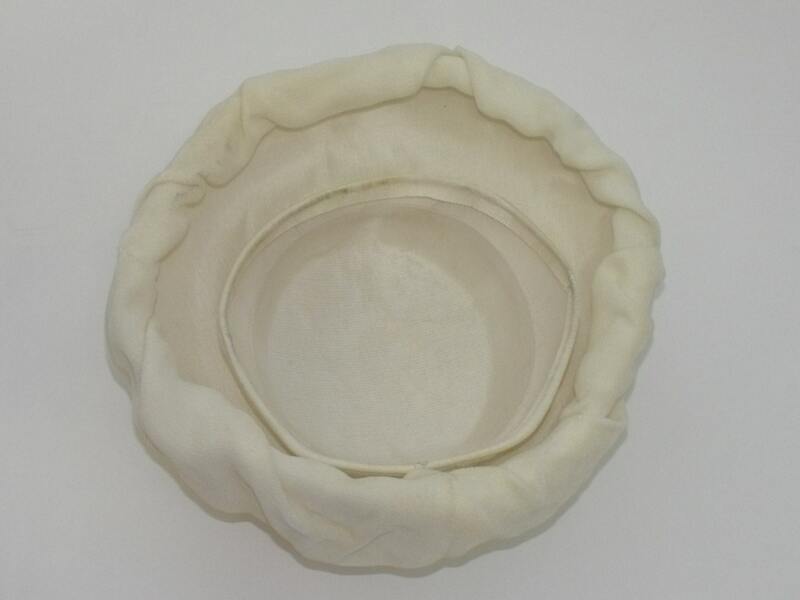 ◊ Diametre 10" x 10.5"
◊ Note: There is some slight wear to the interior hat form and underside of brim. Item will be shipped via Canada Post. We will also ship via Fedex if desired. Fedex rates may be higher than rates listed. Please contact us prior to purchasing if you wish to use the Fedex option. 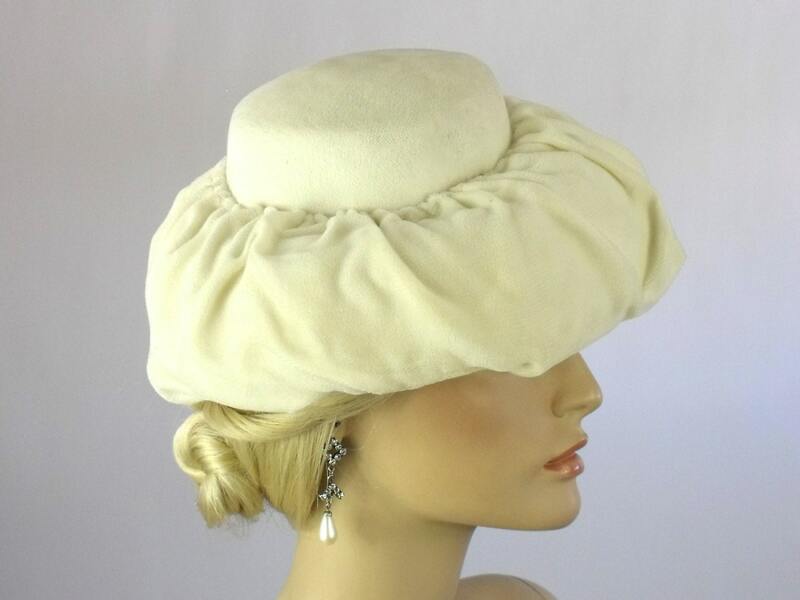 WildWoodRose Vintage accepts PayPal, Credit Cards, Debit Cards and Etsy Gift Cards. Payments must be received within 48 hours of purchase or the item will be re-listed. We are now offering a layaway plan. You may choose a 2 or 3 month payment plan. Contact us for more information. All North American shipments are sent via CANADA POST unless you convo us to request alternate shipping methods. We will ship within 1 to 3 days of receiving payment. We do offer combined shipping. Please contact us prior to purchasing and we will change the shipping cost for you. 5-7 business days and include tracking. All purchases over $150 will be shipped with tracking as an expedited package and shipping quotes will reflect this cost. INTERNATIONAL CUSTOMERS - Please note that you are responsible for all VAT, import fees, duties and taxes imposed by your country. We can not falsify custom forms. These charges are your responsibility, and we have no control over this. Please do not confuse them with additional shipping charges. International Small Packet Shipping via Canada Post can take up to 4 to 6 weeks of business days to arrive. Canada Post Tracked Packet Shipping Rates to International destinations are not included in the shipping rate in the listing. If you require faster service with a tracking number please contact us prior to ordering. We aim to provide our clients with quality items and impeccable customer service. Each one of our items is listed with an extensive description, condition evaluation and detailed measurements. Each vintage piece is unique. We are happy to answer any convos asking for more item details, photos or specific measurements prior to ordering. Please keep in mind that our items are vintage pieces and they have been pre-loved. Due to the nature of vintage clothing and accessories, there may be some minor flaws or imperfections due to previous wear or storage. All of our clothing measurements are based upon precise FLAT measurements and are doubled where required (i.e.) chest, waist & hip. PLEASE KNOW YOUR OWN CURRENT MEASUREMENTS & ALLOW EASE FOR A COMFORTABLE FIT. Please convo us within 48 hours of receiving your order if you intend to request a return. Refunds on the purchase price will be granted if the item is deemed “not as described”. No refunds will be offered as a result of improper fit as we have gone to great lengths to assure precise and accurate measurements in each listing. The item must be returned unworn or unused and in the condition it was sent. Reference photos are kept on file for comparison should any discrepancy or damage from shipping occur. Once received, the purchase price of the item will be refunded. Shipping and return shipping costs are the responsibility of the purchaser. Return shipment must be made via a method of shipping that includes a tracking number and signature upon receipt. This is a Paypal requirement. EU customers, please notify us within 14 days of receiving your purchase if you intend to request a refund as per your Right to Return Directive. We will provide you with any necessary forms and our preferred return address. TAKE CARE WHEN CLEANING YOUR VINTAGE GARMENT. We do not recommend dry-cleaning vintage silk or other delicate fibres. We will not be responsible for any damage that has occurred in the dry-cleaning process after purchase. We clean all vintage items to the best of our ability to maintain the quality of the piece prior to listing. If you are unsure of cleaning methods please contact us prior to heading off to the dry-cleaner! !